First off, let me preface this review by saying that I am an organization freak. I spend more than enough of my day clearing my email inbox, keeping my calendar straight, and creating and checking off my list of to-do items. I feel like I have a pretty tight system in place: Outlook for personal information management (PIM) at home, and Gmail for on the road. Google Calendar on the road and a nice OTA sync with the iPhone (thanks Google!). I just switched from Remember the Milk to Toodledo and recently purchased ToDo to keep things in sync on the iPhone. However, when Organizer came up on the review docket, I decided to give it a try. 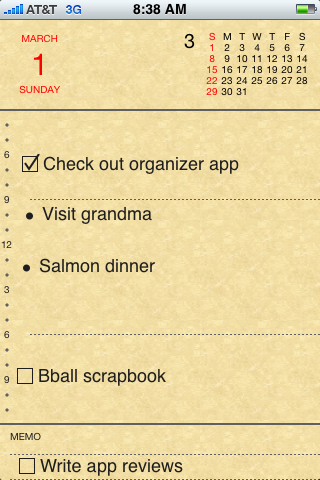 Organizer’s screen looks something straight out of a desk planner that I used to have prior to using electronic PIM devices (ah, memories of my first Palm Pilot, or better yet, my Casio clamshell). A long tap on the iPhone’s screen allows you to input text that you can then manipulate (font, size, color) and place wherever you want on the screen. Changing the bullet point to a checkbox alters the item to a task, and options include a nice cut/paste feature, searchable entries, use of emoji, and inclusion of a landscape view upon rotation of the iPhone. Below are screenshots of all the LockScreen, Notes and System font options that come stock with the FontSwap 1.0b application. The first screenshot will show the title of the font highlighted in blue…the screenshots following that are in that font. This can get a little confusing in the System Font screenshots. Just remember…blue highlight then screenshots of the font. Search is an application that allows you to search for keywords in your Mail, SMS, Notes, Contacts and even on the web. When you open Search, you will notice a lower menu bar with the options; Mail, SMS, Notes, Contacts and Web. At the top of the screen is a Search bar. You can select any of the options in the lower menu bar and then use the search bar to search within that application. The thing that I like about this application is that once it has found an entry you can then select it to see the full Email, SMS message, Note, Contact etc. The Web option will search Google keeping you in the application instead of directing you to Safari so…that is also nice. 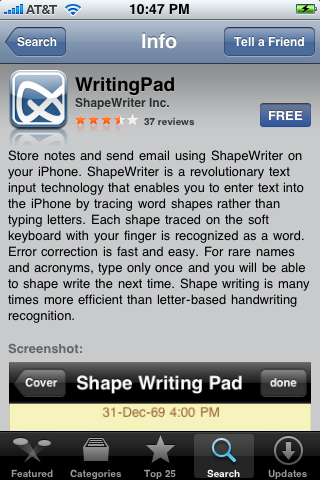 WritingPad is an application by ShapeWriter that allows you to create Notes by using a “revolutionary text input technology that enables you to enter text into the iPhone by tracing word shapes rather than typing letters.” So, what exactly does that mean? Well, when you open WritingPad, you will be greeted with the main page. 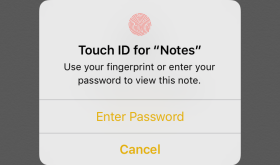 On this page you will see a few default notes explaining the application and how it works including; the basics on how to use the application, how to use the capitalization feature, what to do in the case of double letters and how to add new words to the dictionary. Tap the + icon in the upper right corner to start a new note. You will notice that the note will have the Date and Time at the top and a QWERTY keyboard at the bottom of the screen. Now for the fun part. 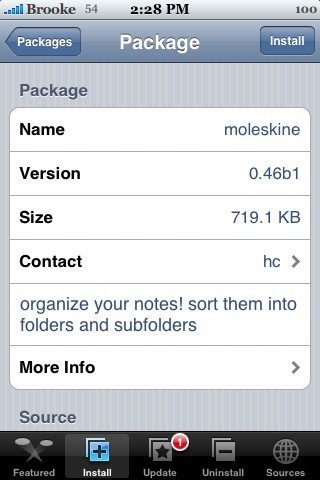 The update to version 0.52b1 of moleskine makes a few changes to the HTML function of the app. Here is what the developer has to say, “Rewrote note import function again to display HTML title properly. But preview of each HTML note will only display properly after viewing it once. If you have never used any application to write your notes in HTML, then you will not see any difference in this release.” moleskine is available via the databinge source. 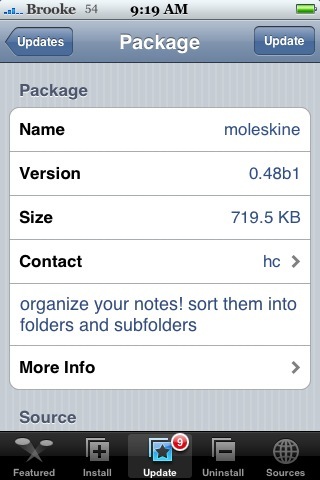 The update to version 0.51b1 of moleskine, a note organizing application, fixes a bug in which the application crashed when tapping on the 1st row in an empty folder. That is it for this update! 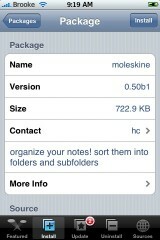 moleskine is available through the databinge source. 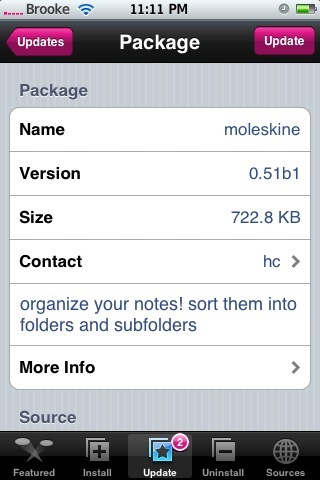 The update to version 0.50b1 of moleskine adds the ability to import HTML notes. It will display the correct format of the HTML file when you import it. However, if you edit the HTML file in moleskine, you will lose the formatting. How you import a note in molekine has not change, just the way they are imported so that it allows for importing of HTML files. So, no visual change to the application. I personally have never had an HTML file in my notes (and am honestly not really sure how you would get an HTML file into your stock Notes.app) but, if this applies to you…I bet it is pretty cool! 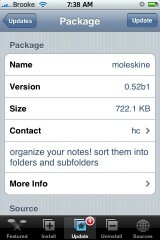 moleskine is available through the databinge source. Version 0.47b1 of moleskine makes a few changes and adds a very cool new features. In this version, the accelerometer has been disabled while creating and new folder/note and while recording sound. Both of which are great changes. The cool new feature is that you can now email the photo’s you take in moleskine. You can either email a note and a photo or just a photo. The photo is attached to the email as a .jpg file which also makes it viewable on the iPhone. 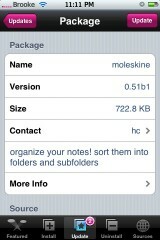 moleskine is available through the databinge source. depending on the order that you want your notes, voice recording(s), photo(s) to show up, you can send and attach files in the order that you wish. Here is a video showing how to email a note with both a photo and sound attachment. There are once again some cool new features in the update to moleskine! You now have the ability to email a note and sound attachment or email just the sound attachment. When you email a sound attachments, it will send it as a .amr file. When I opened the .amr file on my iPhone, it played just fine however when I tried to play the file through QuickTime on my computer it said that the file was not recognized. Still a great feature none the less.